Jim was born in Southwest City, MO. He graduated from McDonald County High School (1971). Jim attended the University of Missouri for undergraduate study, where he earned his degree in business (1975). He continued his education at Mizzou, graduating from the School of Law (1978). 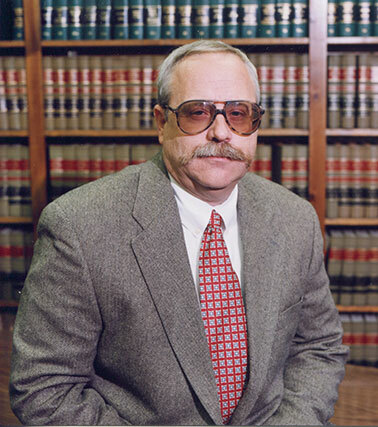 Jim has over 40 years of experience as an attorney in Newton, McDonald, Jasper, Barry, and Lawrence counties. He has served as lead counsel in hundreds of bench (judge-decided) trials. Jim served as Pineville municipal court judge for over 30 years. He served as Anderson municipal court judge for 20 years. Jim focuses his practice on family law, estate planning, and probate. Jim lives in Neosho with his wife, Shelley. Shelley teaches at Anderson Elementary School. Jim and Shelley are members of the United Methodist Church in Anderson. They have one daughter, Emily, who graduated from McDonald County High School in 2011 and the University of Missouri in 2015. Jim’s favorite sports teams are the Missouri Tigers and the St. Louis Cardinals. He also enjoys history.